Maxime Vachier-Lagrave won his last four games on top board as Baden-Baden clinched the German League title for the 13th time in 14 seasons. It was fitting that the decisive match came in the penultimate round against Solingen, who have won the title 12 times themselves. Although wins for MVL, Peter Svidler and Richard Rapport made it look comfortable, it was anything but, and we have interviews with all the winners. Maxime, Peter and 14-year-old Vincent Keymer also talk about the upcoming GRENKE Chess Classic. 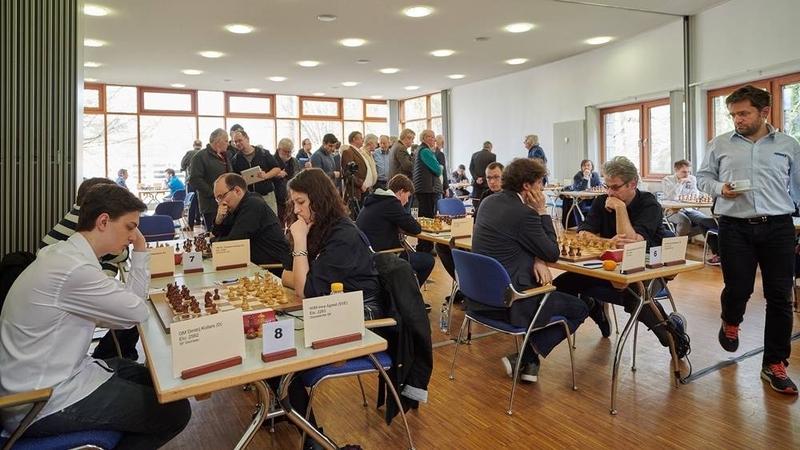 The Schachbundesliga, or German Chess League, is arguably the world’s strongest national team event, and although Baden-Baden have reigned supreme in recent years, it’s been incredibly hard-fought. Last year it went to a playoff, and this year three teams entered the final weekend with chances of the title – Hockenheim, on 21 points, and Baden-Baden and Solingen, both on 22. 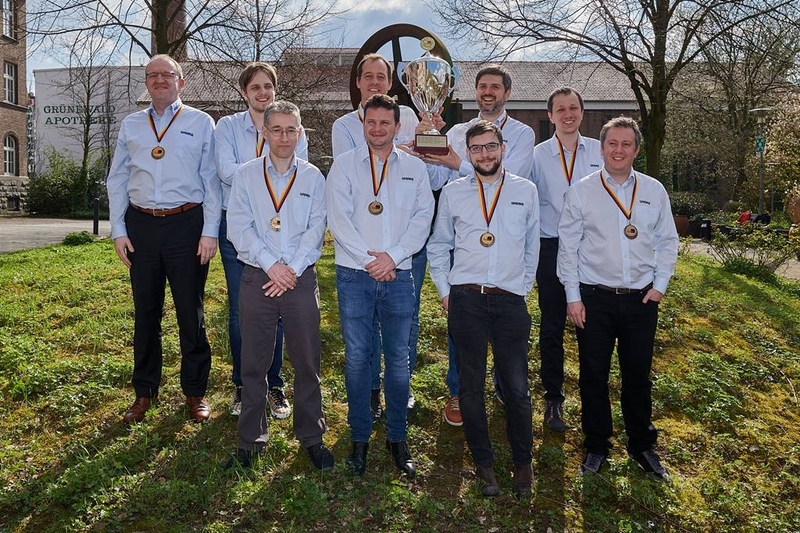 The latter two teams met last Saturday in the penultimate round, with Baden-Baden knowing they were all but guaranteed to be champions if they could win, since they had an easy opponent in the final round. It’s symptomatic of how bad things are that the computer recommends 25.Rxe8!? here, while in the game after 25.Nd4 Ne5! 26.Qh4 Bf7! 27.Bxf7 Qxf7 White was left with a hanging pawn on a2, a bishop on g5 that might run out of squares if Black plays f4 and, in general, a ruined position. Black didn’t put a foot wrong and it was Solingen who took a 3:2 lead in the match! 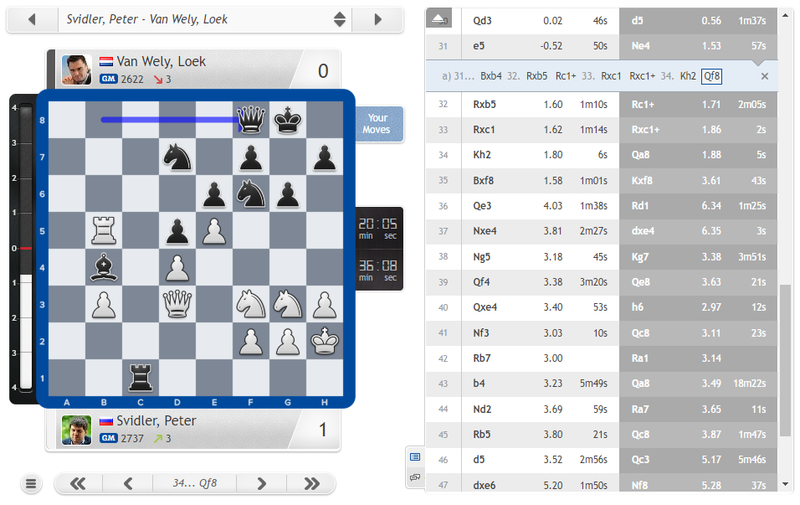 That result would have a ripple effect through the rest of the games, and in particular in the clash of the 8-time Russian Champion Peter Svidler and the 8-time Dutch Champion Loek van Wely. Their 3.Bb5+ Sicilian wasn’t flawless, with Peter seemingly putting half of his moves down to oversights of one kind or another. They led him to feel that “objectively” he should repeat moves for a draw, but seeing Paco was losing he decided he had to play on. The key moment of the whole game came after 31.e5!? Here Loek could have called the bluff and played 31…Bxb4!, since after 32.Rxb5 Black has 32…Rc1+ 33.Rxc1 Rxc1+ 34.Kh2 and now the move both players had missed: 34…Qf8!, covering the bishop. That wasn’t all he talked about, though, and let’s interrupt the Bundesliga action to give some brief highlights. Is Peter looking forward to facing Magnus Carlsen, Fabiano Caruana and co. in one week’s time in the GRENKE Chess Classic? I’m very scared! The line-up is extremely strong and it’s been a while since I played in a round-robin of this strength. I’m very much looking forward to it, I like tournaments like this - who doesn’t like tournaments like this? - but it will be very, very difficult. I want to play, but I’m also very anxious about how I will do, because it’s been a while. I have a decent score against everybody... it doesn’t matter. I am getting older faster than they are getting older, is kind of the point. It sounds stupid, but it’s not! It will be interesting and generally I play quite well, or at least I used to play quite well exactly in tournaments like this, because it’s much easier for me to motivate myself to play against very strong players, but as I said, I haven’t played tournaments like this in a while and I’m quite anxious. What about young Russian talents Vladislav Artemiev and Andrey Esipenko? A new generation is coming in, and it’s nice to see. There was never really any doubt that Russia as a chess country will not stop with my generation, but Artemiev in particular is having an unbelievable year and it’s obvious that he’s here to stay. You will see a lot more of him in the coming years. The match was a lot of pressure, and when I got this winning position quite quickly I felt I need to win and I was trying to be careful, and at some point I was too careful and Hari came back… I lost some tempi trying to deprive him of any counterplay, but it turns out I left him a lot of counterplay! 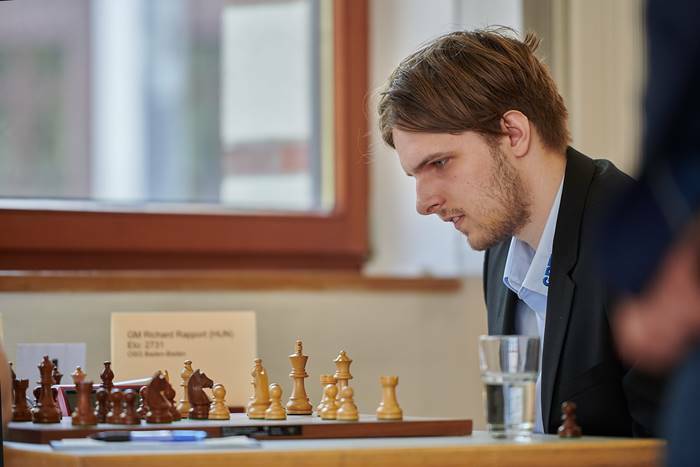 That meant the match could only be saved if Erwin l’Ami could beat Baden-Baden’s star performer, Richard Rapport - the Hungarian GM ended with 8 wins and 5 draws for the season. That match did indeed mean the title for Baden-Baden, since they duly dispatched Düsseldorfer SK 7:1 in the final round, even if Svidler had an interesting morning! After 16 minutes he replied 4.Qb3 and gave an impressive demonstration of how to handle an offbeat opening that had been scoring very well for Black. Just the normal training. Of course it’s a very special tournament, but there’s nothing special you can do. You can train a lot, you can prepare everything, but not some special kind of training. In the end Vincent could only draw with GM Borki Predojevic in the final round, which meant he again fell just short of clinching the grandmaster title with a 3rd norm. It’s all set up for him to try and become a grandmaster when he takes on the world’s best in the GRENKE Chess Classic from next Saturday!